Threaded Fasteners, Inc. (TFI) has an existing facility located on a nearly 4.50-acre parcel off Schillinger Road North in Semmes, Alabama. TFI acquired a 10-acre parcel to the east of the existing manufacturing facility. McFadden Engineering was retained by TFI to provide planning and engineering services to expand its current operation by developing a portion of the 10-acre parcel for construction of an additional facility for a galvanizing operation. McFadden Engineering assisted TFI with site design and layout, grading and drainage design, and design of a detention facility that would allow for additional facility expansion . 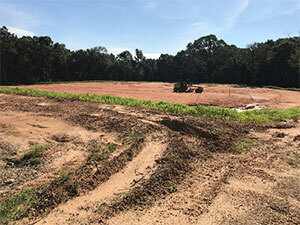 McFadden also handled all permitting through the city of Semmes and the construction stormwater permitting with the Alabama Department of Environmental Management (ADEM). The expansion consisted of major site work to compensate for a 15-foot elevation drop between the existing facility and new property. The site was graded and leveled to minimize the amount of fill material that would have to be trucked from an outside source to construct the new facility. Grate inlets were installed to provide drainage around the proposed building and the proposed parking/laydown yard area. The drainage plan also included filling the existing detention pond area at its current facility and expanding TFI’s current material laydown yard area. Drainage infrastructure (stormwater inlets, pipes, etc.) was installed to collect the stormwater currently being collected in the detention area and route it to an existing, natural drainage path on the property. Ultimately, this stormwater was retained in a new, larger detention area prior to being discharged via its natural drainage way. 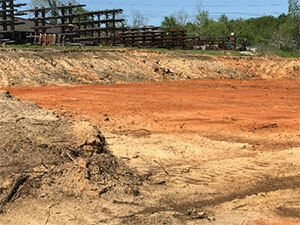 McFadden Engineering assisted TFI with coordination of utilities for the new site with local utility companies and assisted the site contractor with implementation of erosion control measures to protect adjacent properties from stormwater runoff and ADEM permit compliance.